We are hereby delighted to present to you our camping site and summer house rentals and hope that you will be able to find a summer home that satisfies your wishes and needs. 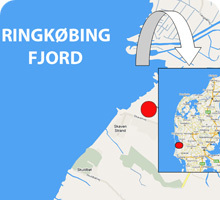 Our camping site and summer homes are only a few meters from Ringkøbing Fjord, where the beautiful nature invites you to hiking and biking trips. The hiking and biking trips can either be along the water or a trip out to the new Skjern Creek National Park. If you are more to the watery scene, then Skaven Beach is a wonderful place for surfers or kite surfers. The low waters and almost always strong winds make the place to one of the best surfing areas in northern Europe.